I was recently reading about an upcoming conference at the Vatican entitled “The Pastoral Project of Evangelii Gaudium” to implement the Holy Father’s new apostolic exhortation, “The Joy of the Gospel”. The keynote speaker is Jean Vanier, founder of L’Arche communities, a group of homes for the disabled where their gifts are cherished. For a minute I pondered the unconventional choice of speaker. The point of the conference is to help bishops bring the joy of the Gospel to their flocks, and Fr Geno Sylva, the planner of the conference, chose a man known for seeing the spiritual gifts in the disabled. 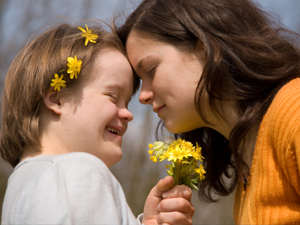 It was a connection that would escape many, yet the understanding of the connection between those with special needs and evangelization is becoming more and more common; the disabled, the little ones in the eyes of the world, are becoming recognized as living Gospels for those of us who are in need of evangelization. I see it as the mother of a 12 year old daughter with Down syndrome. Many times after Mass parishioners will share with us that seeing my daughter at prayer or receiving the Eucharist inspired them. I hear it when I speak about my book A Special Mother is Born on live radio and the phone lines light up with people anxious to tell their favorite memory of a loved one with a disability who helped expand their heart and grow their faith. The stories in the book have inspired parents who have received a prenatal diagnosis of Down syndrome to bring their child to birth despite their overwhelming fears. Our children have the purity of heart you must have to see God, but perhaps their greatest gift is that they help us see Him as well. Here is the story of a Canadian doctor who experienced a conversion from seeing nothing wrong with abortion to a rich life of faith. But it slowly began to dawn on Dr. Lewis — by God’s grace, she says — that abortions were not a reasonable or safe option for either the mother or, of course, the baby. It was especially babies targeted for abortion because of a chromosomal abnormality that brought this to her attention. “Gradually God began to reveal to me His heart for life. First He highlighted people with Down’s syndrome in our community,” she said. It’s up to each and every one of us to change the world into just that. It’s up to us to break down stigmas, motivate positive perspectives, see the ability in all, and respect and appreciate the value in everyone. Joy, acceptance, love, and faith, coming from those who once embraced the right to abort such children. These children facilitate this miracle of grace in the hearts of those who experience the love they exude from every pore. So, Father Geno, thank you for calling up Jean Vanier, the world’s greatest advocate for those whom the world calls “disabled”, to teach the shepherds of the Church to look to these blessed individuals whose innocent faces behold God as examples to follow. If our faces could shine with that same pure love, our smiles could transmit that same electric joy, and our arms be as ready to embrace others, we would truly understand how to share the joy of the Gospel! Sean Varner is a former student fellow with The Center for Vision & Values at Grove City College and a current graduate student at Missouri State University’s Department of Defense and Strategic Studies in Fairfax, VA.